We all know love matters. 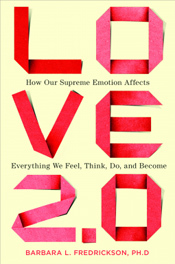 But in this newly-published and groundbreaking book, Love 2.0: How Our Supreme Emotion Affects Everything We Feel, Think, Do, and Become, positive emotions expert Barbara L. Fredrickson, PhD, shows us just how much. Even more than happiness and optimism, love holds the key to improving our mental and physical health and lengthening our lives. Barbara examines and rejects commonly-held notions about the nature of love and then, using physiological research data from the laboratory she directs, redefines love as micromoments of connection between people-even strangers. She demonstrates that our capacity for experiencing love can be measured and strengthened in ways that will improve our health, resilience, and sense of well-being. Love 2.0 is eminently practical, weaving “together several new strands of science while keeping an eye toward the spiritual and the practical.” Barbara writes, for example, that in Love 2.0 ” I offer you explicit guidance on how to more often and more effectively seed love, love for yourself and love for others, through thick and thin, in sickness and in health. “You’ll come away having learned that love need not remain an unpredictable and elusive state.With practice, you’ll find you can generate love anytime you wish. Love will become a renewable resource that you can tap to fuel your own wellbeing, and the wellbeing of all those within your radius.” (emphasis added). Now how can you not attend this interview? Please come and bring all your questions. Longing. You know the feeling. It’s that ache of sensing that something vital is missing from your life; a deep thirst for more. More meaning, more connection, more energy-more something. Longng is that feeling that courses through your body just before you decide that you’re restless, lonely, or unhappy. Barb’s Website for her new book, Love 2.0 An important website supporting Love 2.0. The Science of Love: How Positivity Resonance Shapes the Way We Connect by Maria Popova (1/28/13) The neurobiology of how the warmest emotion blurs the boundaries by you and not-you. 10 things you might not know about love A CNN Health Interview (1/24/13). Video. Using Positivity to Bounce Back from Inevitable Setbacks. (:87). An excellent detailed lecture that includes Barb talking about her personal experience on 9/11/01 and the role of positive emotion in crises. Based on Barb’s work covered in her first book, Positivity. The Positive Emotions and Psychophysiology Lab (PEPLab) at UNC-Chapel Hill, where Barbara is Director and Principal Investigator. Spread the Love–the Benefits of Bonding Oprah Magazine Interview (2/13). A refreshing biographical snapshot and personal interview with Barbara in The Sun Magazine, 2009 with information on cultivating positivity, the value of negative emotions, and how to balance these two mindsets.